Valley of the Brain Collectors as a sandbox had plenty of optional encounters. However my players are very focused, it didn’t make sense to their practical hearted characters to disturb every nest in the Scar of the Spider. They stayed on mission. So they actually minimised and avoided contact with the inhabitants totally skipping the Cthulhu Mythos inhabited Fungal Cave. Here is the Gug with the Pathfinder original here. Compression. A gug can contort and distend its limbs for greater reach or to wriggle easily through impossibly Small passages. Regeneration. The gug regains 10 hit points at the start of its turn if it has at least 1 hit point. Multiattack. 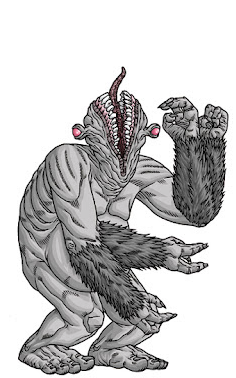 The gug makes three attacks: one with its bite and two with its claws. Bite. Melee Weapon Attack: +9 to hit, reach 15 ft., one target. Hit: 9 (ld8 + 5) piercing damage plus 7 (2d6) psychic damage. Claws. Melee Weapon Attack: +9 to hit, reach 15 ft., one target. Hit: 10 (ld10 + 5) slashing damage plus 7 (2d6) psychic damage. This towering menace has a horrible, vertically aligned mouth and arms that split at the elbows into twin clawed hands.